I did not put off doing the landry all week. I did not finally do it YESTERDAY. 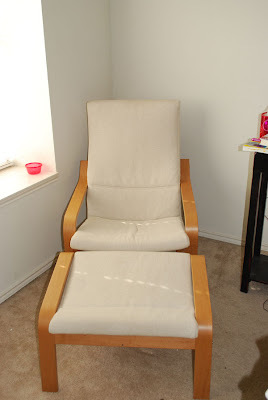 And my chair does not finally look like this again. I am not ready to go to Colorado this week. I am am not scared about how bad I am going to be at snowboarding. I did not already pack for the trip, because that would mean I am not being organized. I did not try to practice in my snowboard for over 30 minutes yesterday in my living room. Because flat carpet is just like a snowy mountain! Gosh I wish I had a picture of that! I am not dreading being away from Rilan for 5 days. And on that not I am not looking forward to having an adult vacation and being alone with Dax for 5 days. Okay pretty lame first Not Me! Monday post. I promise it will get better. Feel free to join in!! Be sure to check out MckMama's blog for her Not Me! Monday post.